When we talk about blending we are talking about the way learners sound out phonemes and blend them together to decode words. A student should be taught to blend small units of speech sounds called phonemes orally well before they are expected to translate graphemes (letter shapes) into phonemes and then blend them. However, it is this letter shape- to phoneme blending- to word decoding that we associate most strongly with ‘reading’. Having said this, learning to blend phonemes is not always a straightforward part of the learning to read process. Many students with dyslexia find blending sounds difficult because they have poor phonemic awareness. Phonemic awareness is a subset of phonological awareness that deals with a student’s ability to segment, blend and manipulate individual phonemes. A phoneme is the smallest measurement of sound that carries meaning. In the English language there are 44 phonemes and, in order to decode words, students must first be able to manipulate these speech sounds and blend them together to form words. The next stage of the blending/reading jigsaw is when graphemes (letter shapes) are added. Students who can identify syllables and have good phonological awareness and who can also manipulate each of the 44 English phonemes are ready to link those sounds to graphemes in a cumulative and systematic order. We call this part of the reading journey ‘phonics’. 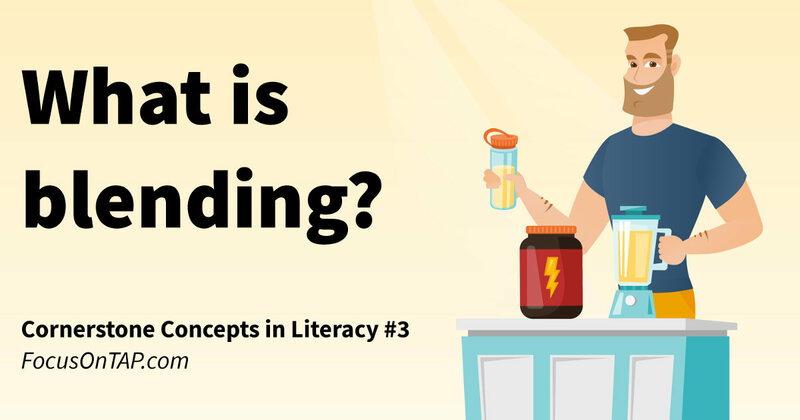 Why do Readers Struggle with Blending? So, back to our initial question about blending and there are a few answers. It is important to acknowledge that dyslexic learners often have a deficit in processing speech sounds. This results in them finding it hard to process the individual sounds within words. This deficit and the extra effort required to process phonemes allows for only a limited capacity in working memory for phonemes to be manipulated and linked together. This usually presents itself as a student who laboriously sounds out phonemes but still struggles to link those sounds together to form a word. There are also many ‘instructional casualties’ who also fail to blend. These learners often present similarly to those mentioned above but, with observation, it becomes clear that the reasons for their inability to blend is as a result of poor grapheme to phoneme correspondence based on poor knowledge. When I use the term ‘instructional casualty’ I infer that these learners have simply not been taught the letter sounds that are required to blend and decode words. Many of this group will learn to decode, blend sounds and read very quickly once they are taught systematic and cumulative phonics and can recall the sounds of graphemes and morphemes automatically. Following on from this, there is another group of learners who learn to manipulate phonemes but who struggle to remember and recall the relationship between the shape of a letter (grapheme) and its phonemic (sound) representation. This group again will struggle to blend because they spend much of their capacity in working memory on recalling the phonemes and don’t have enough space left for blending those sounds. What can be Done to Help students Who Struggle to Blend and Decode? Most importantly, systematic and cumulative phonics must be taught via direct instruction in all schools and to emergent readers of all ages. Without a systematic approach, learners are not provided with the pre-knowledge required to read well. Phonemic awareness is key to teaching blending. For those students who cannot yet process the 44 sounds of the English language, they must be taught to do this. Schools often rush this part of the reading process, particularly with older learners. In younger pre-readers, phonemic awareness can be taught separately without letter graphemes and then later in conjunction with phonics when graphemes are introduced. However, when working with older emergent readers phonemic awareness can also be built alongside phoneme to grapheme correspondence knowledge. One example of an activity that can help to develop phonemic awareness is that of sound boxes, or Elkonin boxes. Boxes are drawn to represent the number of phonemes within a given word presented pictorially or orally. Students then identify individual sounds by tapping or placing a counter in each box to represent each phoneme. This activity allows an emergent reader to manipulate and consolidate his or her awareness of the 44 phonemes. Once this awareness and manipulation has become automatic, a student is ready to link these sounds to the graphemes we use to represent them. Sound to grapheme correspondence, sometimes also known as sound-symbol association or the alphabetic principle, is the ability to translate the graphemes that represent the 44 phonemes in the English language in to their sounds and vice versa. The is a two way process and students must be able to ‘read’ each grapheme and know its sound and also be able to hear a phoneme and represent it with the appropriate grapheme. Traditional phonic cards, card games and sound packs may be used to help students remember graphemes. For students who struggle to remember them, key words and visual memory strategies may be useful. For example, ‘q’ might be associated to the word queen and a large drawing of the grapheme might be decorated with a face and a crown. The addition of a ‘u’ as an umbrella walking stick that the old queen must use in words can be a very helpful semantic memory strategy for some students. How can TAP novels Help? TAP Library novels work hand in hand with the direct instruction of systematic and cumulative phonics. The Systematic phonic progression embedded in each level allows for students to practise decoding only with those graphemes and phonemes that have already been systematically taught and remembered. This automaticity works to reduce load in working memory and encourages emergent readers to blend, decode and read words independently. This is the third in a series of posts entitled “Cornerstone Concepts in Literacy”. The previous posts were about closed syllables and the meaning of symbols like CVC and open syllables and their importance for emergent or beginner readers.